Gary Vecchiarelli is in love with a dinosaur. That may sound like a great premise for a Saturday morning cartoon show, but Vecchiarelli, a 33-year-old Boonton resident, is a real person, not some Barney Rubble wannabe. A paleontological field associate and graduate student at New Jersey City University, where he is completing his master's in geology and education, Vecchiarelli is also a man on a mission: to turn the 66.5-million-year-old Drypto-saurus, one of two Late Cretaceous-era dinosaurs known to have lived in what is now New Jersey, into a household name, right up there with Albert Einstein, Snooki Polizzi and Route 80. Vecchiarelli's goals include a life-size reconstruction of Dryptosaurus built and displayed in the New Jersey State Museum in Trenton. And it's an end shared by museum administrators, who say they hope to have just such an exhibit in place when the museum's renovated natural history hall reopens, perhaps as soon as next year. Vecchiarelli has his fingers crossed, even though he admits that many Jerseyans are still shocked to hear their state and "dinosaurs" mentioned in the same sentence. Dinosaurs did roam the Garden State, though, and two of them, Hadrosaurus foulkii and Dryptosaurus, made paleontological history in the 19th century, when their remains  the most extensive collection of dinosaur bones found in North America until that time  were dug up in Haddonfield and Barnsboro, respectively. On June 13, 1991, then-Governor Jim Florio designated Hadrosaurus foulkii as the state's official dinosaur, giving it a place of honor next to blueberries (the state fruit) and honeybees (the state insect). Vecchiarelli insists he's cool with this, though. After all, he says, Hadro-saurus was discovered first  in 1858, seven years before Dryptosaurus was found nearby. Still, it's hard not to wonder which of these two Jurassic Jersey Boys was more ... umm ... Jersey. Paleontologist Jason Schein, an assistant curator at the State Museum, describes the Hadros as duck-billed vegetarians. "They were kind of the cows of that period, probably lived in herds, and spent their time trying to eat and not be eaten." The Dryptos, on the other hand, were loud, aggressive carnivores that liked to roam the coastline. So, which sounds more like a "Jersey Shore" cast member to you? Vecchiarelli has spent well over a year promoting his beloved carnivore (part of a family headed by Tyrannosaurus rex) and lobbying for the life-size reconstruction, which he says should be displayed in the state in which it was discovered. A Hadrosaurus exhibit does exist, but it's across the state line, in  Boo! Hiss!  the dinosaur hall of Philadelphia's Academy of Natural Sciences. "Drypto," Vecchiarelli says, "was the first predatory dinosaur found in the world, and it was found right here in New Jersey. And this is where the reconstruction ought to be." His home is dripping in Dryptosaurus memorabilia  even the license plate on Vecchiarelli's Jeep reads "DRYPTO"  but the Boonton resident admits that it was another Jerseyan, famed paleontologist Robert T. Bakker, who pushed him into all this. Bakker, a onetime Bergen County resident and graduate of Ridgewood High School, is the author of "The Dinosaur Heresies" and served as a technical adviser on "Jurassic Park" and the 1992 PBS series "The Dinosaurs." "I was working last year at Dino Day at the Newark Museum," Vecchiarelli recalls, "and I saw [Bakker] there and approached him. We talked about Drypto and he said, 'You should be getting a movement together!' " Vecchiarelli took Bakker's advice, creating a Web site (njdino.com), a Facebook page (Project Dryptosaurus) and launching a series of lectures on Drypto throughout New Jersey. Since the Web site was launched last year, Vecchiarelli says he has been receiving close to a thousand letters a week from dinosaur fans all around the world, many of them children. "Kids will help make this a reality," Vecchiarelli says, noting that his own passion for dinosaurs began when he was 10, after his mother took him and his twin sisters to the Museum of Natural History. His first question at the time: "Did we have dinosaurs in New Jersey?" Vecchiarelli discussed the possibility of a Drypto exhibit with the State Museum's Schein in November. "He had all this fire for the project," Vecchiarelli recalls. The reconstruction Schein envisions will actually be two life-sized Drypto skeletons, in which one is seen attacking the other, which borrows from a famous painting by paleo-artist Charles R. Knight. Called "Leaping Laelaps," it was painted in 1897 for the American Museum of Natural History, with the cooperation of Edward Drinker Cope, the scientist who discovered both Hadrosaurus and Dryptosaurus. Cope originally called Drypto "Laelaps" (after a dog from Greek mythology), but it was later learned that the name had already been taken  by a mite. Although most of the dinosaur remains found in the Garden State were unearthed in South Jersey, Schein says dinosaurs most certainly lived up north as well. 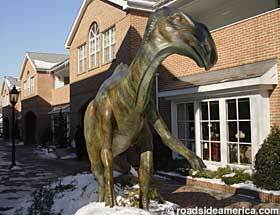 "In fact," he says, "North Jersey is one of the world's greatest dinosaur trackway sites. Multiple footprints have been found in the north, particularly in the [Woodland Park] area because of so many of the old quarries that were there." Despite his enthusiasm for Project Dryptosaurus, Vecchiarelli is learning to be patient. "You have to when you're dealing with the state, especially in this economy," he says. The reconstruction, which would most likely be made of Fiberglas or resin, would cost about $100,000, Vecchiarelli says, with some additional funding needed for the rest of the exhibit, which, he adds, could be garnered from private donors. The State Museum has released no figures or dates as yet, because of current financial constraints and since details of the exhibit are still being discussed. But, Schein insists, "We want to do this, and it is in our plans for the renovation." How does Vecchiarelli think Drypto would feel about his valiant efforts? "Oh, I think he would thank me," Vecchiarelli says. "Then, he would eat me." I saw one of them collecting tolls in a toll booth on the Jersey Pike once. The Hadrosaurus would go on to become the first mounted dinosaur skeleton in the world (see below) and is now the official state dinosaur of New Jersey. Thanks Coleus! Now you say "fuggetaboutit". Prolly says more about New Jerseyites than dinosaurs. For a moment here I thought they were talking about Frank “The Fossil’’ Lautenberg. Ancient treasure comes home: 200-million-year-old fossil back in N.J.